Motor Expo Most Wanted - Fiat! Submitted by peter on 22 February, 2009 - 20:30. Although most automakers seem to be trying hard to keep a positive attitude in the face of a dramatic slow down in the industry, few are as optimistic as Hyundai Thailand. The company is eyeing 63% growth this year, and is already looking forward to introducing new cars. Of course Hyundai can realise this 63% growth by achieving sales of just 1,500 units this year, compared to about 900 units in 2008. Hyundai's big seller is the H1, a people mover/VAN that offers good value for money despite coming into the country in CBU (completely built up) form. Hyundai will introduce a freshened up version of the H1, to be kitted out with some extra equipment, at the upcoming Bangkok Motor Show. 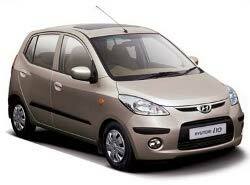 Perhaps of more interest is the possible introduction of the Hyundai i10. The i10 is a small car that could bring a value alternative to the Jazz/Yaris. Hyundai is currently waiting for the conclusion of free-trade talks between India and Thailand which could pave the way for the i10 to be brought to Thailand. Interestingly the i10 will have a wide choice of power plants to choose from, including a diesel-hybrid. Assuming everything goes well, the i10 could be here in 2011.